A Lord Mayor’s Day Night Mare is a satirical work of art by Charles Motte, and is intended to portray a newly elected mayor after the celebratory feast. 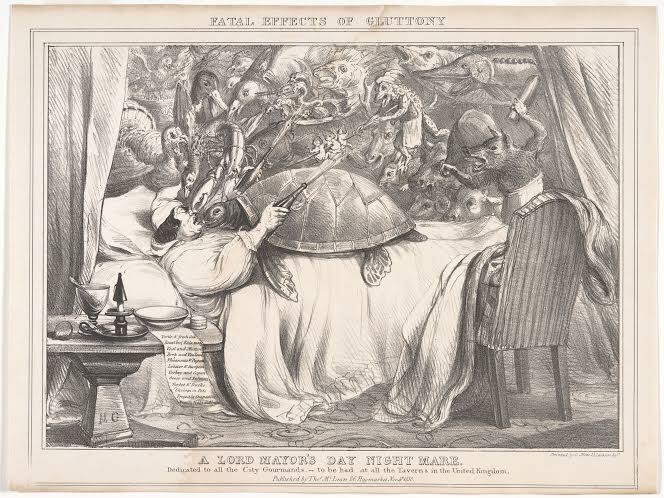 The glutinous act of the lord mayor can be seen in by the variety of animals that surround him as he sleeps, torturing him as though they are ghosts returning to haunt their consumer. Each of the animals depicted in the piece is representative of a food typically served at the Lord Mayor’s Day feast, and the abundance is representative of the abundance of wealth and power within the British political system. It is perhaps also representative of the corruption and excessive assertion of power as this piece was published during a time of extensive colonization. The amount of food that one consumes, mirrors their social ranking—a ranking that was often used to assert influence over those of a lower social status. Thus, Motte not only establishes a connection between feasting and gluttony, but a deeper connection between consumption and corruption.